Archaeologist Saul Lazenby has been all but unemployable since his disgrace during the War. Now he scrapes a living working for a rich eccentric who believes in magic. Saul knows it’s a lot of nonsense...except that he begins to find himself in increasingly strange and frightening situations. And at every turn he runs into the sardonic, mysterious Randolph Glyde. Randolph is the last of an ancient line of arcanists, commanding deep secrets and extraordinary powers as he struggles to fulfil his family duties in a war-torn world. He knows there's something odd going on with the haunted-looking man who keeps turning up in all the wrong places. The only question for Randolph is whether Saul is victim or villain. Saul hasn’t trusted anyone in a long time. But as the supernatural threat grows, along with the desire between them, he’ll need to believe in evasive, enraging, devastatingly attractive Randolph. Because he may be the only man who can save Saul’s life—or his soul. I’m tempted to limit this review to one word and leave it at that. What word, you ask? I adore this book on so many (dare I say ‘all’) levels. To begin with there’s the story as a whole; a stunning combination of historical fiction and highly imaginative paranormal fantasy. These two, seemingly at odds, sub genres melted into each other as if they had always been meant to be used together. I found myself at times forgetting where one ended and the other began, almost accepting the ‘shadow cabinet’ and ‘War Beneath’ as fact and wondering why I didn’t know more about them. As for our main characters… Both Saul Lazenby and Randolph Glyde were such a wonderful combination of needy and weary. Both have resigned themselves to a life of solitude. Of course there’s the little matter that their attraction for those of their own gender is illegal, but it’s more than that. Saul fears that his disgrace will forever keep him separate from others while Randolph’s life is too dedicated to his duty for him to image ever having somebody by his side; especially someone uninitiated. I loved that after his initial cynicism with regard to his employer’s theories, Saul accepts what Randolph tells him without drama. He has experienced the inexplicable, therefore he doesn’t deny its existence. It’s such a relief not to have one of the main characters exclaim something along the lines of ‘this can’t be happening, it’s impossible’ while clearly whatever it is, is happening all around them. And I adored how these two men, once they get of their initial suspicions, just click. They are exactly what the other needs in every way imaginable. The witty, at times snarky exchanges between them had me smiling while their coming together was as hot as it was sweet. To make a rather long story short; this book was amazing on every level imaginable. 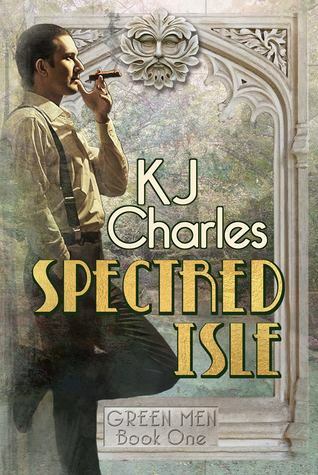 There are few experiences as good as completely losing myself in a story and Sceptred Isle captivated me. I can’t wait for the next book and will have to get and read The Secret Case Book of Simon Feximal asap. As for everybody else: Do yourself a HUGE favour and go and read this book. It’s Fa. Bu. Lous. I enjoyed the book quite a lot... except for one small part. It included tentacles. It tore me right out of the story, because I found it totally unbelievable. Otherwise? Excellent, as always. LOL, I can't say the tentacles bothered me at all. I guess I was too lost in the story to have anything pull me out of it.